The next step is to define Pilot Points. Pilot points are simple XY points with an initial value for each parameter that you want PEST to estimate. Pilot points can be imported from .TXT file, XLS, .SHP file, or assigned manually by digitizing in the 2D environment. An example of the pilot points on top of conductivity zones is shown below. •Click (Next Step button) to add these points. In the table in the lower half of the window, specify which pilot points are "Fixed". Fixed pilot points are those that have initial values that are well known, and will not be adjusted during the PEST run. Examples of these include points where you have pumping/slug test data. For all other points, their initial value is taken from the property zone in which the specific point lies. •the regularization information for these fixed parameters is not included under the *prior information section. This is only applicable when one of the regularization options are used in the PEST run. Once you are finished, be sure to repeat these steps for the other parameter zones you have included. You must create a distinct set of pilot points for each of the parameter-zones you selected in the previous step. Using conventional model calibration technology, the calibration process would use one parameter associated with a property zone, and adjusting these parameters until the fit between model outcomes and field observations is as good as possible. If the goodness of fit obtained on the basis of these zones was not acceptable, then extra zones would be introduced into the model domain at locations where the modeler felt that they would “do the most good”; the parameterization process would then be repeated with the new parameters included. If a good fit was still not obtained, more zones would then be introduced. The process would continue until the fit between model outcomes and field observations was acceptable. •The procedure is quite laborious and slow. •In a case such as the present one, geological mapping provides no guidance on where to put extra zones; hence the final distribution of zones that the modeler achieves using this process is likely to be subjective and non-unique. •Characterization of geological heterogeneity in the present study area by zones of piecewise uniformity is not in harmony with the nature of the alluvial material; therefore any zonation pattern that is finally decided upon will not “look right”; it will be defensible only on the basis that it is better to employ such a zonation scheme than to ignore geological heterogeneity altogether. •Piecewise constancy as a method of characterizing geological heterogeneity lacks the flexibility required to explore the effects of small scale geological variability on model predictive uncertainty. To overcome these problems, the distribution of transmissivity within the model domain will be described by a set of pilot points. A number of these pilot points will be introduced to the model domain and PEST will be asked to estimate the transmissivity of the aquifer at each such point. These “point-transmissivities” will then be spatially interpolated to all of the active cells within the model domain using Kriging. Hence in estimating transmissivity values at pilot points, PEST will effectively be assigning parameter values to the whole of the model domain. 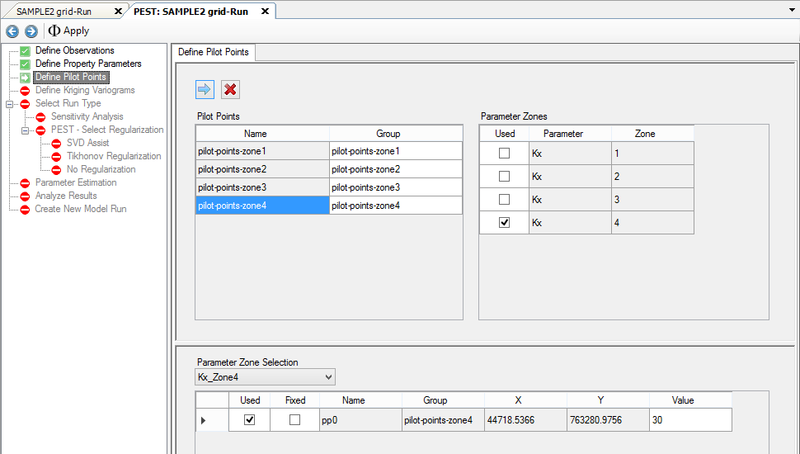 Individual pilot points can be assigned to different zones within the model domain. Only those points assigned to a particular zone can be used in calculating transmissivity values throughout that zone using the Kriging interpolation procedure. Furthermore, the variogram upon which Kriging is based can be different in each zone, reflecting differences in the geology, or in the level of heterogeneity, expected within each geological unit. Note that if only one pilot point is assigned to a particular zone, then that zone is characterised as being uniform. Conventional wisdom dictates that the number of parameters involved in a parameter estimation exercise should be kept to a minimum. However when using pilot points in conjunction with PEST’s new regularization mode, the opposite is often true. PEST’s regularization functionality prevents the onset of numerical instability which often accompanies attempts to solve over-parameterised inverse problems. Furthermore, a superfluity of pilot points allows PEST to achieve a much better fit between model outcomes and field observations. Reference: Calibration and Uncertainty Analysis for Complex Environmental Models, by John Doherty (2015). •There is no need to be parsimonious; use as many pilot points as you can. Let PEST do the regularization (use SVD, Tikhonov, SVD-assist or all of these together). •Use more pilot points in those parts of the model domain where information has a high spatial density (for example where there are more observation wells). •Try to place pilot points between head measurement wells in the direction of groundwater flow where they represent hydraulic conductivity. 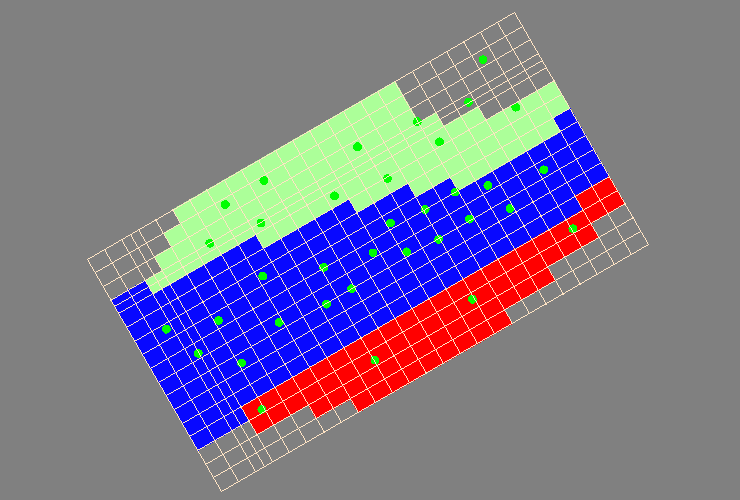 Place them on measurement wells where they represent specific yield or storage coefficient. •Make sure you place hydraulic conductivity pilot points between measurement wells and any downstream boundary, for it is the hydraulic conductivity of the material between these wells and the boundary that determines the heads in those wells. •Don’t leave any large gaps in the final pilot points pattern. •If you use preferred value regularization (i.e. you have selected Preferred Value Tikhonov Regularization) consider using a covariance matrix instead of weights for the prior information equations. See the PPCOV utility from the Groundwater Data Utilities suite. •If you are absolutely sure that no heterogeneity can arise over a distance of less than x, then don’t place any pilot points closer together than a distance of x.